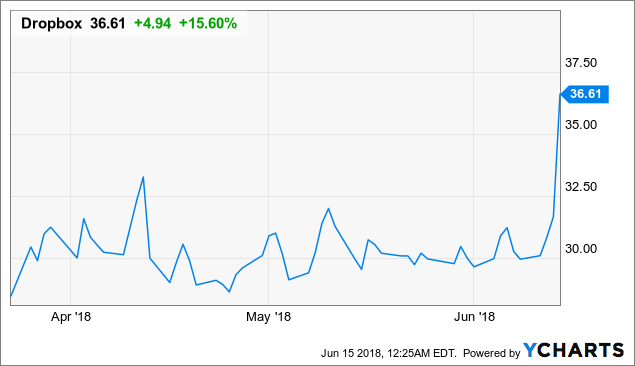 Today, June 14th, 2018 DropBox (DBX ) shares were trading more than 5 times their normal trading volume and the stock hit an all-time high of $38. Dropbox (DBX) premiered its IPO in March- it was up 35% on the first day of trading. Companies interested in purchasing Dropbox in the future would be Microsoft. Cisco, Google, Apple, and Salesforce.com. Salesforce.com owns 6.5% of Dropbox (DBX). There was no the news today to make the stock soar up to 18%. Looks like a buyout may be in the works? CEO Drew Houston made a statement that user growth with Premium plans drove revenue up for the quarter. The company earned 1.1 billion in revenue in 2017. Dropbox has 500 million users that store their documents and folders, which they can access from any device. 11 million of those users pay for the storage services. Dropbox (DBX) has free accounts which are basic with an allowed amount of 2 GB of space. Dropbox Professional and Dropbox Plus plans offer 1TB of space for Dropbox business clients. The company announced an update on the magnetic recording storage technology that it has, and that it would be the first to implement the technology at Exabyte scale. 36% of shares are held by insiders and 97% of shares are held by institutions. Profit margins are down 46.3% trading margins are down 46 points percent from the recent quarter on March 31st, 2018. Revenue is at 1.18 billion with revenue per share at 2.970. Operating cash flow stands at 335.5 million. Levered free cash flow stand that 514.62 million.